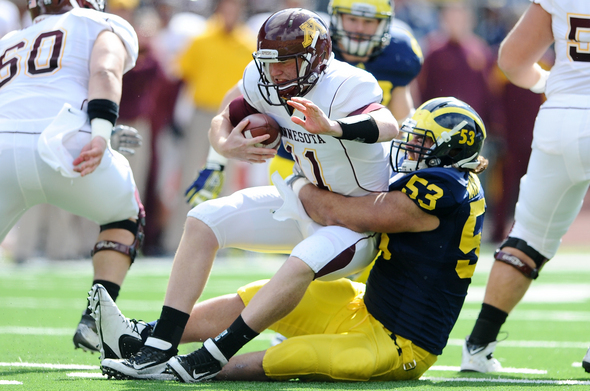 Posted on Thu, Nov 3, 2011 : 5:59 a.m.
Michigan senior defensive lineman Ryan Van Bergen: "We want to be remembered as a team that got us back to a 10-, 11-, 12-win season." November is when championships are won in the Big Ten, and the Michigan football team is germane to that discussion for the first time in a long time. But that's not enough for these Wolverines players, who have become jaded by the meltdowns of the past two years. The seniors were just 6-18 in Big Ten play entering this season. Now, they are preparing to play Iowa on Saturday (Noon, ESPN) in a three-way tie atop the Legends Division race. This will be the first November game any of them have played while in first place in the Big Ten. Heck, it's the first time any of them have opened November with more than one league win. "It means everything, and it means nothing," senior defensive lineman Ryan Van Bergen said this week. "We've gotten ourselves to this point because we've got seven wins, which matches our (high) total since we've been (here). "But, if we stumble in these last four games, it's not going to mean anything to us. ... We want to make a statement. We want to be remembered as a team that got us back to a 10-, 11-, 12-win season." The 13th-ranked Wolverines are 7-1 overall, their best start since 2006, and 3-1 in Big Ten play. That puts them in a three-way tie with Michigan State and Nebraska atop the division. Michigan needs some help to qualify for the Big Ten championship game, as it lost to the Spartans three weeks ago and would lose in a tiebreaker. Making matters worse, Michigan State has the easiest remaining schedule among the division leaders. The combined record of its final four opponents is 11-22. The odds are long for the Wolverines to play for a title, and they don't control their own destiny. That's not how players look at it, though. Michigan senior tight end Kevin Koger: "My first year, it was hard bringing a lot of energy knowing we weren't going to a bowl game." They're just happy to be playing for more than bragging rights. "We feel like we're finally back at Michigan and people finally fear us again," senior safety Troy Woolfolk said. "We've got that reputation, so we just want to go out there and take it game by game to come out and try to win that Big Ten championship." Now is when things will begin to heat up. The Wolverines have had a fortuitous schedule so far, hitting the road only to play at Northwestern, a friendly environment for any opponent (and especially Michigan), and neighboring Michigan State. They also miss Penn State and Wisconsin completely. This week, though, Michigan initiates its most daunting four-game stretch of the season with a difficult road game at Iowa. The Hawkeyes are unbeaten this year at Kinnick Stadium and averaging 39.2 points per game there, as opposed to 21.7 on the road. Michigan lost 30-28 in its last game in Iowa City in 2009. The Wolverines then will travel to Illinois next week and close with home games against Nebraska and Ohio State. The combined record of their final four opponents is an impressive 23-10. "When you get into November, you play for championships in the Big Ten Conference," Hoke said. "That's how it's been for many years." Well, they're actually won in December now, with the inaugural Big Ten title game being played Dec. 3 this year. But to qualify for that game, Michigan probably has to sweep its four November games — a tough task, to be sure. The Wolverines are good enough to win each of those games, and streaky enough to lose each of them. Neither scenario is likely; both are plausible. Either way, this week's game means something, and the Michigan seniors are grateful to be in that position. "It gives the team more confidence to know we can still win the Big Ten championship, as opposed to the other years we were out of the race by now," senior tight end Kevin Koger said. "My first year, it was hard bringing a lot of energy knowing we weren't going to a bowl game, and just the grind of the season — you've already played eight games and that takes a toll on your body. "But now, you come into the building and we enjoy being there." Fri, Nov 4, 2011 : 8:24 p.m.
Fri, Nov 4, 2011 : 8:41 p.m.
Fri, Nov 4, 2011 : 4:49 p.m.
&quot;They stand in such stark constrast to the seniors on the team during the last coaching transititon.&quot; &quot;They didn't sell out the program...&quot;. Who in the hell are &quot;They&quot;? You mean past players who had the unfortunate timing to be stuck with a coach who will be remembered as the WCiMFH? And you blame the players? Gee, I guess it wasn't Capt. Smith fault the &quot;Titanic&quot; hit an iceberg. Let's see. Set the course. Set the speed. Took a nap. Sank the ship. Yep, sounds just like the leadership skills of the WCiMFH. I sure hope you can justify throwing college football players under the bus. And a Michigan bus at that. TiM (and you aren't.) Go Blue! Fri, Nov 4, 2011 : 8:47 p.m.
Matt, who is &quot;They&quot;? I'm waiting for an answer. And to quote Adlai Stephenson at the UN during the Cuban Missile Crisis, &quot;I'm willing to wait until hell freezes over...&quot; to get your reply. &quot;They&quot; are Michigan football players. You are a class act, throwing Michigan players under the bus. Just like the WCiMFH. Fri, Nov 4, 2011 : 8:36 p.m.
Fri, Nov 4, 2011 : 6:39 p.m.
What does WCiMFH stand for? And what leads you to believe that RR fell asleep at the wheel? Do you think he wanted to start the youngest lineup in the nation in '08 and '09? If you really believe that it was RR at the helm when this Titanic went down, then it was Lloyd who set the course, set the speed, took a fireman's axe to the controls, then took off in the only safety boat. In RR's first year, JUB quoted Van Bergen as saying there were no more players with hidden agendas on the team anymore. They were united as a team after that first year. Part of that was due to an adversity-filled year together for a bunch of young players, but part of that was also addition through subtraction. The negative influences had left. What led guys like Toney Clemons and Greg Mathews (who actually fessed up and apologized) to go to the Freep and make the false claims that they did? Why would they want to do that? You think it was because the seniors on the team were setting the right tone, encouraging everyone to buy into the RR regime? You're naive if you think so. Fri, Nov 4, 2011 : 1:57 p.m. These seniors are the epitome of what a Michigan Man really is. They've stuck it out through three of the most tumultuous years in Michigan's history, and they didn't sell out the program. They deserve every bit of success and recognition they receive, because they've worked their tails off and kept a good attitude through the process. They stand in such stark contrast to the seniors who were on the team through the last coaching transition. They've set the tone for this year's freshman class, and no matter the outcome of this season, they're legends in my book. To Molk, Koger, Martin, Van Bergen, Huyge, Hemingway, Odoms, Woolfolk, and all the other seniors who have stuck it out - those who stay will be champions! Go blue! Thu, Nov 3, 2011 : 5:37 p.m. There's this one guy that I know and he said that Koger, van bergen and woolfolk will all win the heisman next year. Trust me, this guy knows what he's talking about...He's a soduku wizard. MEEEEEEEEEEEEEEEANchigan football is again on the rise!! This little trifecta is a heisman suprise!!! Thu, Nov 3, 2011 : 2:31 p.m.
A road win against IA will be a huge emotional lift for the entire team. The seniors are a part of the team and has the special leadership qualities. I do not feel that the Wolverines will come out flat against IA. It sounds like the IA defense is suspect and not that good against dual threat QBs. Michigan has the advantage, there. Michigan will have to stop the tailback and pressure the young QB. If they can do othat, we sould win. The other issue would be to have Denard/Devin not throw any pics. If Michigan does come out with a win @ IA, there will be lots of momentum for the next game @ IL. Weather @ IA: Sunshine, windy and mild. Temps 55-60, WInd South around 20 mph. There should be some impact there but not as bad as the 30+ wind speeds vs MSU. Thu, Nov 3, 2011 : 1:01 p.m.
We as fans that were paying attention at the beginning of this process noticed a couple of things. First is that the confidence of this coaching staff and its expectations are unwaivering! It is unacceptable to fail (mentally) and if you as a player do not understand that then you wont play. Second, the goals are set where they should be and that is to beat ohio and win the big ten. As much as losing to MSU is not fun it is no different then losing to Northwestern, it is just another loss to michigan and its fans. To MSU it is the biggest game they play. Third, there is a atmosphere of calm and success at UM that was missing for 3 years. There is no more panic on the sidelines or yelling and screaming and flailing in the air like in previous years. That attitude is infectious and translates to the players. Fourth, UM has a coach that takes responsibility for not coaching kids to their fullest instead of the previous staff blaming the kids for not being good enough. Blu I think you can use day in your quote! What a difference a day makes! That day was Jan. 11th 2011! Imagine what this coaching staff will do in 3-4 years when their system is fulling understood, they have a QB that is the complete package (has anyone seen the video of Morris throwing it 50 yards from his knee and 80 from standing?! ), and they have a core of players on D like Countess and Jake Ryan dominating! 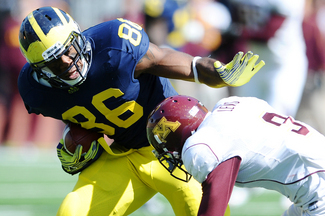 The future always looks bright for Michigan football and now is no exception. Go Blue and hammer the Hawks!!! Fri, Nov 4, 2011 : 2:50 p.m.
c19 Certainly a milestone day, 1/11/11, and by all appearences, every day since. You will have to forgive some of the posters who wish to cloud the issue of bad coaching by blaming coaches with a 30 year track record at Michigan and who is an inductee into the College Football Hall of Fame. There is this one coach, Lloyd Carr, who had an incredible winning record vs Top 5, 10, and 20 teams during his tenure as head coach at Michigan. Let's hope Coach Hoke continues his legacy. TiM Go Blue! Thu, Nov 3, 2011 : 4:01 p.m.
Chiro19. Actually, we can say that the TWO previous coaches were supect. Except for 2006, UM hasn't been playing Michigan football since about 2000. A lot of people here are 'RR haters', and that' certainly their privilige, but it was Carr that created the problem and he didn't do it overnight. It took him about 7 years to run the program into the ground. RR is a michigan man, just like any of the other 19 head coaches here. As far as the next 3 or 4 years, I don't get too carried away with hypethicals. The a only thing that counts is saturday at noon. Iowa is the only team on my mind. Anything else, and a buck, will get you a coffee at MacDonald's. Thu, Nov 3, 2011 : 12:56 p.m.
&quot;The Wolverines are good enough to win each of those games, and streaky enough to lose each of them. Neither scenario is likely; both are plausible.&quot; Kyle, I'm not a writer and I'm definitely not a sports journalist, but I've done my share of reading. The paragraph above, I know it was a throw away line, a way to start closing your column, but &quot;streaky enough to lose each of them&quot; implies that this Michigan football team this year has had at least one losing streak. I suppose that is true, they have had one, one game losing streak. The Wolverines are indeed good enough to win each of those games, yet raw and inexperienced enough to lose each of them. Thu, Nov 3, 2011 : 4:24 p.m.
Or &quot;inconsistent&quot; if you're looking for a degree more precision. To be honest, I rather liked the original &quot;streaky&quot; ... in the sense that it conveyed the nature of Michigan's inconsistency. It's not inconsistent one play to the next so much. It's that they play well for a quarter or a half, then play not-so-well for a quarter or a half. Thu, Nov 3, 2011 : 2:40 p.m.
Mich, I think agree with you. &quot;Raw&quot; is a much better word choice. I'll go with it instead of &quot;streaky.&quot; Good suggestion. Thanks! Thu, Nov 3, 2011 : 10:43 a.m. Cue the music...&quot;What a difference a 'year' makes&quot;! So it's suppose to be a 'day' but that didn't work. Coaching is the difference and that's all the needs to be said. TiM Go Blue! Fri, Nov 4, 2011 : 4:58 p.m.
Also, to respond to your assertion that my &quot;focus&quot; is solely on the players for why Michigan tanked: that is part of my focus. To focus on one aspect and say &quot;this is why Michigan was terrible&quot; is to miss the point. There were so many things that went wrong, and only a few of those things were within RR's control. Fri, Nov 4, 2011 : 4:54 p.m.
How was Rodriguez a flawed coach, more so than any other coach in the country? Obviously, every coach has his weaknesses. RR's was his struggle to find a competent D-Coordinator. But do you realize how good our offense was last year? We tore up Wisconsin's defense more than any other offense that played them. We averaged more yards per carry for the season than in any other season at Michigan, ever. And that was with a sophomore quarterback in his first year as a college starter. Can you imagine how good our offense would be this year if RR had gotten another year? I wish RR had gotten another year, but I'm over it. It's an exercise in futility to consider &quot;what could be.&quot; But it annoys me to no end when people refuse to look beyond the wins and losses from the past 3 years and see what really happened. Hoke has done a great job, and Michigan is winning. But his first year and RR's first year aren't even close to comparable, in terms of the circumstances surrounding them. Fri, Nov 4, 2011 : 4:53 p.m.
Fri, Nov 4, 2011 : 4:37 p.m.
Matt, I was considering an in depth answer until I read below that you blame past seniors for letting down the team during the reign of the WCiMFH. Really? The players let the coach down? That's your focus for why Michigan football was pitiful the last 3 years? I'm sorry but I will not engage in a converation where someone steps on the backs of past players to support a flawed coach. TiM Go Blue. Blu, not at all. I'd be interested to hear your rationale if you think differently. Fri, Nov 4, 2011 : 2:25 p.m.
Matt, is that a rhetorical question, I hope? Fri, Nov 4, 2011 : 1:23 p.m.
You really think coaching was the reason we tanked these last three years?